Less than a month after Sony's Men in Black 4 brought on Chris Hemsworth to star, the studio has found a familiar co-star for their leading man. Actress Tessa Thompson, who recently starred alongside Hemsworth in the Marvel Cinematic Universe adventure Thor: Ragnarok, has come aboard as the female lead. This new report adds that Chris Hemsworth's deal is still not closed yet, but it's expected to be finalized soon. Unfortunately, no details were given for either Chris Hemsworth or Tessa Thompson's characters yet, but this project is said to be more of an ensemble piece than a "two-hander," with the story also expected to be more global in scope. Previous reports claimed that the story would be set in London, but that has yet to be confirmed by the studio at this time. Way back in 2015, producer Laurie MacDonald stated that the new Men in Black movie would center on a female lead joining the Men in Black team, but it seems the story has expanded greatly in scope between now and then. Will Smith and Tommy Lee Jones will not return to reprise their Agent J and Agent K characters, although this story will be set in the contemporary sci-fi world they inhabited. 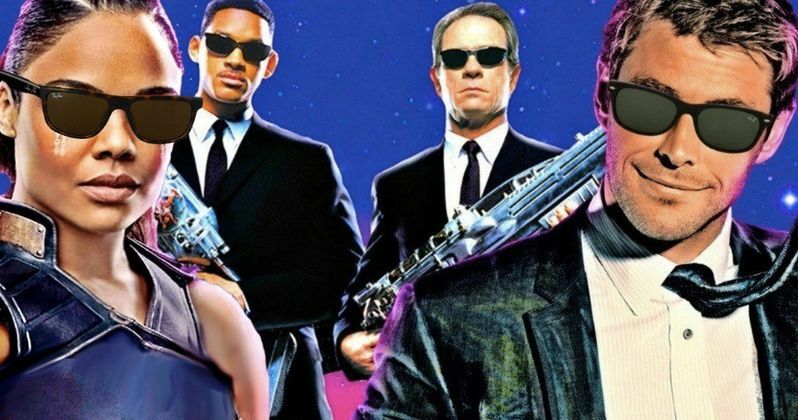 There is no indication yet if other characters from the existing Men in Black franchise will be brought back, such as Emma Thompson's Agent O or others, since this will not be a straight-up reboot of the original franchise. This new project has been compared to the approach of Jurassic World, which was set several years after the original Jurassic Park, while focusing on new characters. F. Gary Gray (The Fate of the Furious) has been slated to direct, working from a script by Art Marcum and Matt Holloway (Iron Man). Original Men in Black producers Walter Parkes and Laurie MacDonald are returning to produce, alongside original executive producer Steven Spielberg. Sony has already set a June 14, 2019 release date, putting this project up against another sequel/remake hybrid, New Line's Shaft. That project is currently in production, starring Richard Roundtree as the original John Shaft, Samuel L. Jackson as his nephew, John Shaft II and Jessie T. Usher as his son, John Shaft Jr.
Tessa Thompson had previously starred in TV roles such as Jackie Cook on Veronica Mars, Laurel Harris on 666 Park Avenue and Sara Freeman on Copper, along with a number of minor film roles and guest-starring TV roles, before her breakout role in the 2014 indie movie Dear White People. She went on to star in Selma, Creed, War on Everyone and South Dakota before joining the Marvel Cinematic Universe as Valkyrie in last year's blockbuster Thor: Ragnarok. This year, she starred in the critically-acclaimed thriller Annihilation and she returns as Charlotte Hale on Season 2 of HBO's Westworld. She is also in post-production on her new film Little Woods and is slated to return as Bianca in Creed 2. The Hollywood Reporter broke the news on this casting earlier today.